Evergreen content can be your best friend when you are posting on social media because it gives you something to share on those days when you are really struggling to think of something to share with all your connections, fans and followers. Evergreen content is the content that you can always refer to and share. For example, if you are a hairdresser and you share a blog post about how to care for your hair this is evergreen content, but that blog post about the best hair trends for summer 2015 is not evergreen as it is limited to the summer of 2015; of course you could use it in a throwback post, but you know what we mean. What you need to remember on social media is that not every single one of your connections will see every single post that you upload on social media so it is okay to post the same thing more than once. 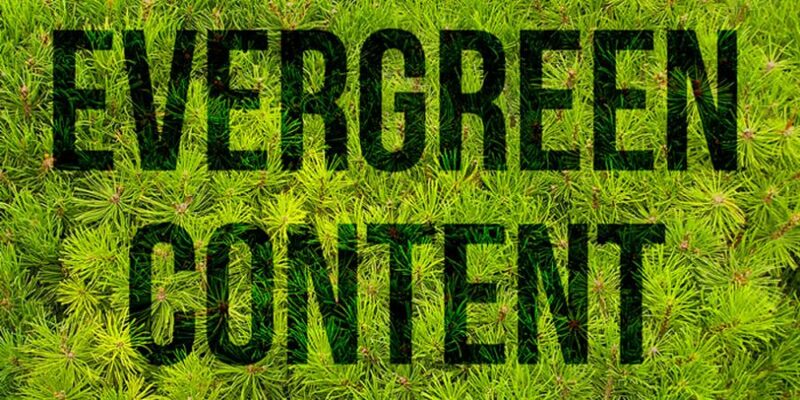 The main benefit of evergreen content is that you can refer back to it when people ask questions about that topic or you can share it multiple times on social media as it will still be relevant. However, it does depend on the blog post that you are sharing. As with the examples above, if you were to share best hair trends for summer 2015 just before Christmas in 2017 it may look a little odd and certainly out of place. But, if you were to share the blog about how to care for your hair 3-4 times a month this would be absolutely fine; depending on how you do it! And don’t forget to use a social media scheduling tool like Hootsuite to stay active on social media and schedule in these different versions of updates for your blog posts. Often evergreen content is about something of interest to your target audience, and will often be an FAQ so this means when you go to networking events or meet potential clients and they ask you that question you can not only give an answer on the spot but you could follow up with a friendly email and a link to the blog post where you go into more detail about the question they asked you. If you would like help creating evergreen website content then please do not hesitate to contact us directly; we would be only too happy to help.